This is the second part of a two-part series on construction cost overruns. Please see part one: Martin J. Greenberg and Daniel S. MacMillan, Cost Overruns and Sports Venue Construction, Sport$Biz (Jan. 3, 2017), https://www.greenberglawoffice.com/sports-venue-construction/. In Part 1 of this article the authors explored the definitions of construction cost overruns, its causes, a case study involving the Cincinnati Bengals and cost overruns, stadium budget overrun comparisons, contract overrun provisions in leases and other documents, and a specific review of recent overrun occurrences or contract provisions such as the Minnesota Vikings, Atlanta Falcons, Milwaukee Bucks, Los Angeles Stadium, and several college and high school sports facilities. In Part 2 of this article the authors endeavored to examine cost overruns on an international scale. First, we will look at whether a country should make the ultimate decision as to whether or not to be the host country or city for a mega-event. 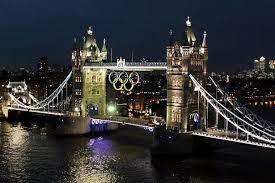 Secondly, we will look at the cost overruns that have plagued the Winter and Summer Olympics in past years. We will then analyze cost overruns as they have affected the World Cup. Thirdly, we will look at some specific international stadiums experiencing cost overruns such as Tottenham Hotspur and Wembley Stadium. The final part of this article will be a discussion on how cost overruns may be ultimately minimized or mitigated. II. Should Countries or Cities Undertake a Mega-Event and Risk the Costs and Overruns with the Mega-Event Syndrome? Table 1. The mega-event syndrome: symptoms and consequences. Before any country or city makes the ultimate decision to become a bidder for a mega-event, a cost-benefit and symptoms-consequences analysis must be undertaken. As we all know, the Olympic Games began in ancient Greece. “From the 8th century B.C. to the 4th century A.D., the Games were held every four years in Olympia, located in the western Peloponnese peninsula, in honor of the god Zeus.” A stadium accommodating tens of thousands of spectators was built during the 2nd century A.D., but the setting always remained rural. “We know that they actually planted the stadium with wheat,” Paul Christesen, professor of Ancient Greek History at Dartmouth College said. 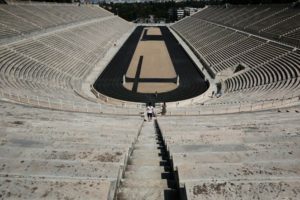 “It was a big empty space that wasn’t being used most of the time, so except in the run-up to the Games, when they got it all cleaned up, it was just a wheat field.” “The first modern Olympics took place in 1896 in Athens, and featured 280 participants from 13 nations, competing in 43 events.” In 1924 the Winter Olympics debuted and featured events such as figure skating, ice hockey, bobsledding, and the biathlon. The Summer Olympics and the Winter Olympics take place every four years, and since 1994 they have alternated every two years. Needless to say that the venues for the Olympics have changed quite a bit over the centuries. Host cities are now required to make a tremendous commitment of human resources and funding to create the facilities and infrastructure necessary to host the Olympics. The threat posed by cost overruns is omnipresent in high profile construction projects, and we need look no further than to the Olympics Games to begin our analysis. We first reviewed the growth of the Olympic Games over time, determined the causes of construction costs overruns, and ultimately will provide strategies for mitigation. The event hosting of the Olympic Games became increasingly difficult as participation and interest rose throughout the 1960s and 70s. Influence of complicated environmental conditions and sufficient territorial extension. E.g. large temperature differences, soil conditions, strong winds, large linear risks (i.e. pipelines, railways). High level of influence on environment. As discussed in Part 1, taxpayer funded stadium projects have become commonplace in American professional sports and are often plagued by cost overruns. Using tactics like those observed by American team owners to finance stadium construction, the International Olympic Committee (“IOC”) has become adept at extracting concessions from taxpayers in would-be Olympic host cities. In attracting hosts for a massive event like the Olympics, government officials encourage citizenry that the endeavor will create thousands of jobs and grow tax revenues. While host nations tend to experience a significant increase in trade after hosting the Olympic Games, this trend also held true for nations that made losing bids for the Games. This suggests that the benefit came from “[t]he signal that a country was open for business, not from [hosting the Olympics] itself.” Moreover, there is little evidence to prove that tourism is largely influenced by the Games—Britain amassed 5% fewer tourists in the month that the games were held than were recorded in the same month in 2011. 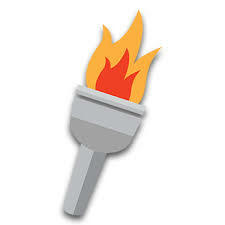 It is also unlikely that a host nation will recover its expenditures with revenues raised from hosting an Olympic Games. The 2012 London Summer Games racked up a total of nearly $18 billion in expenses and only amassed a mere $3.5 billion in revenue. Infrastructure built for Olympic events has proven the most likely cause of cost overruns in relation to an entire Olympic budget. Host nations are obligated to build sports venues, Olympic villages, media facilities, and ensure the capability of their own urban infrastructure system at the same time. Hosts are often able to ‘break-even,’ from an operations perspective—game day revenues (tickets, sponsorship and broadcast revenues) will usually outpace accommodation costs (food/beverage service, security, transportation)—but this calculation does not include a nation’s capital expenditure. 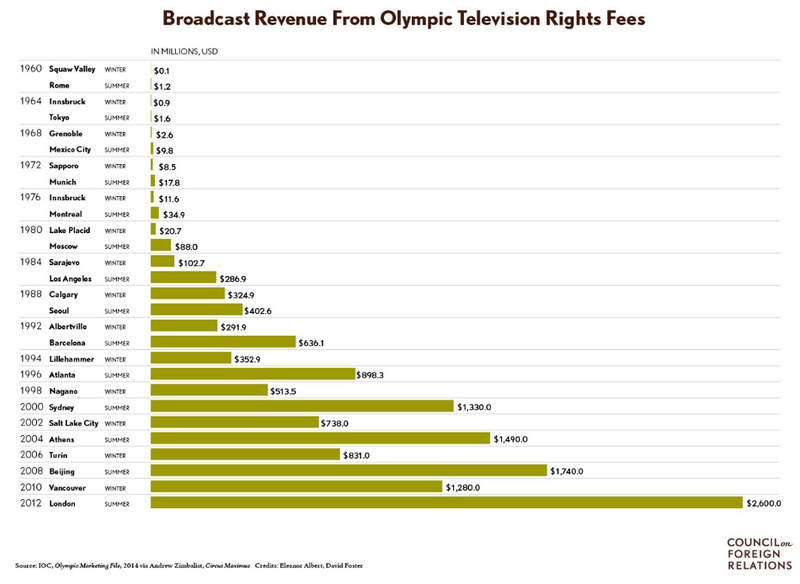 As recently as the 1990s, the IOC took only a 4% share of broadcast revenues, but that share has risen to at least 70% of potential revenues, leaving even less for the host nation. Olympic budgets are set with legal requirements for the host city and national government to guarantee any cost overruns. History suggests that such a guarantee would be equivalent to writing a blank check for the event. The Olympic bidding process only exacerbates the issue, as potential host nations must woo the IOC with stadium and accommodation proposals. David Goldblatt, author of The Games: A Global History of the Olympics, described the process as a “relentless underestimation of costs” and asserted that “[i]f anyone knew the real bill at the beginning they would never sign up.” James McBride, writing for the Council on Foreign Relations, describes that certain implicit costs of the Olympics like debt service, maintenance costs, and the opportunity cost of foregoing other government priorities, can put a host nation at risk. As discussed, cost overruns are often caused by unpredictable circumstances and inefficiencies in management, but history has shown that many of the facilities constructed for Olympic use are abandoned soon after the closing ceremonies. The $480 million stadium that housed sporting events and the opening/closing ceremonies for the 2008 Beijing Games, now sits dormant. Dubbed the ‘Bird’s Nest’ for its woven, metal appearance, the stadium costs over $11 million in upkeep and maintenance per year and remains without a full-time tenant. Swiss Architecture and Construction firm Herzog & de Meuron designed the stadium to stand for over 100 years, and after a short ten years, the stadium exists only as a “symbol of modern China and the engineering ability of mankind.” Similarly, many of the facilities built for the 2004 Athens Games, and the 2016 Summer Games in Rio have been neglected. 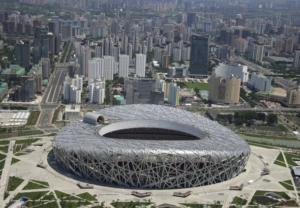 Economics Professor Andrew Zimbalist calls these massive stadium projects “white elephants” and argues that “[t]he environment in which the preparations for the Games takes place is not conducive to rational, effective planning.” In a 2012 article for The Atlantic, Zimbalist describes the bidding process as “frenzied” and one that often does not encourage the proper allocation of scarce public resources. The 2016 Summer Rio Games were no exception in the case of budget overruns and underestimations. Rio de Janiero, Brazil, boasted a very different landscape in the Fall of 2009 when it won the bid for the 2016 Summer Olympic Games. At the time, Brazil had risen out of an economic recession and was recording substantial economic growth, making it an attractive host location. Moreover, the Olympic Games had never been hosted on South American soil, making Rio a seemingly ideal location. In 2016, the script had been flipped on its head—the country experienced its worst economic recession since the 1930s following the 2016 Summer Games. 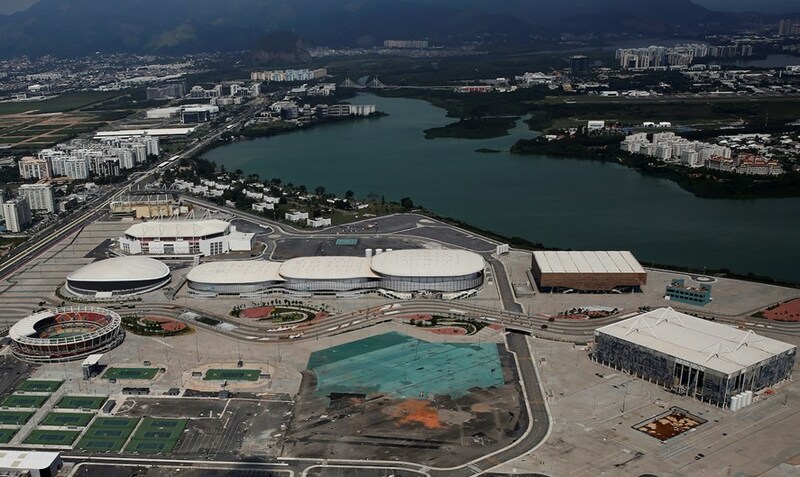 The bid submitted for the 2016 Summer Games required massive expenditures to construct the necessary infrastructure, and execution proved extremely problematic for the Brazilian government. Within months of the beginning of the 2016 games, Rio’s governor declared a state of emergency that authorized funding to ensure the nation would fulfill its commitments to the Olympic and Paralympic Games. 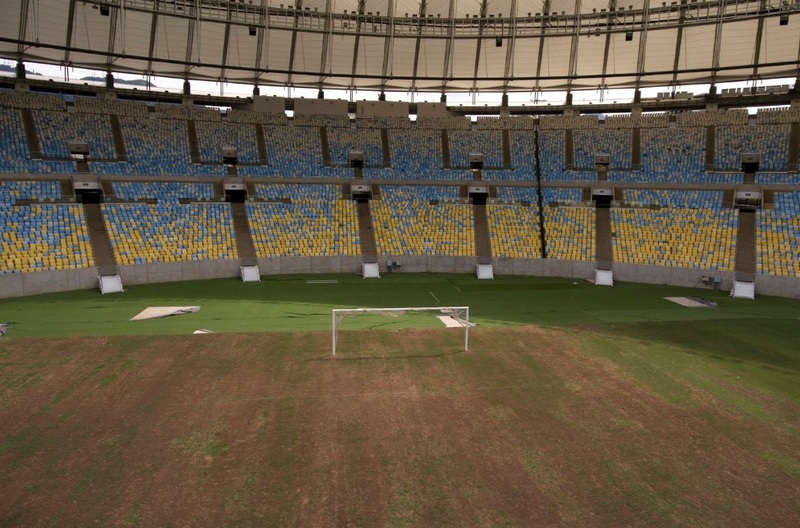 Just months after the completion of the Rio games, many of the newly erected Brazilian stadiums laid abandoned and in disrepair, and the shadow of the 2016 Summer Games continues to haunt the Brazilian economy. The table below reflects estimated expenses and the totals of over expenditures for Olympics Games between 1988-2014. Table 2. Expenses and over expenditure for Olympics 1988-2014. Only recently has there been a trend toward cost control, and efforts have still failed to create a sustainable environment for future host cities. In the 1990s, the IOC introduced an initiative called the Olympic Games Knowledge Management Program (“KMP”), which aimed to reduce inefficiencies in site and personnel management for future host cities. The KMP’s efforts to create a system of shared information and best practices have positively impacted participating nations. Rio’s cost overrun of 50.6% was much lower than that of the previous two Olympiads in London and Sochi, coming in at 76% and 289% respectively. The table below from Cost and Cost Overrun at the Games, demonstrates a downward trend in overall cost overruns after the implementation of the KMP. While the data suggest that the KMP has been effective in curbing cost overruns for the Olympic host, the problem will probably not subside as cost control measures are far from perfect. Cost and Cost Overrun at the Games draws a few broad conclusions that effectively demonstrate the risk of hosting the Olympic Games. 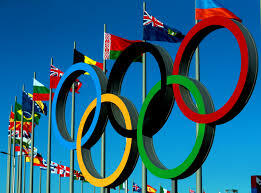 Its authors concluded that (1) all games, without exception, have cost overruns, (2) the Olympic Games have the highest average cost overruns of any type of megaproject, and (3) the high average cost overruns for the Games, combined with the existence of outliers, should be cause for caution for anyone considering hosting the Games. The 2020 Olympics in Tokyo, Japan are already expected to produce massive cost overruns. The budget for the 2020 games was estimated at about $28 billion, or 3 trillion yen, and costs have risen continually in the years leading up to the event. At the end of 2017, Japanese officials made a concerted effort to cut costs and control potential cost overruns. Specifically, Japanese officials have moved events out of the capital city to take advantage of existing facilities. As of February of 2017, Budapest had withdrawn its bid to host the 2024 Olympic Games, leaving Paris and Los Angeles as the lone contenders. Soon thereafter in July 2017, the IOC reached an agreement to award two host locations simultaneously, the first such occasion in the history of the Olympic Games. The agreement would award the 2024 Games to Paris, and the 2028 Games to Los Angeles. Included in the agreement was a $1.8 billion dollar aid package from the IOC to the City of Los Angeles, intended to curb project costs, invest in urban development, and protect area taxpayers. California’s Governor, Jerry Brown, delivered a state-funded $250 million guarantee against cost overruns with the passing of SB 1465 to create a state-funded Olympic Games Trust Fund for potential cost overruns. In mid-January of 2018, Los Angeles 2028 confirmed that it had successfully received the first instalment payment from the International Olympic Committee in the amount of $9 million. The first $180 million of the larger sum of $898 million to be provided by the IOC will be paid-out over five years, in quarterly instalments. Sports and entertainment attorney Kelly Crabb of Sheppard Mullin Richter & Hampton LLP, called the recent deal “totally unprecedented,” and suggested that “[t]he IOC had to offer some incentives [to Los Angeles] to take the 2028 Games because it is so far away. . .” This agreement suggests that a lack of potential host nations has given contenders greater leverage over the IOC than ever before. Olympic planners for LA 2028 are predicting a $160 million surplus created from the $4.66 billion cost of the entire event. The surplus projection is largely based on the prior existence of over 85% of the stadium facilities needed to house Olympic events. It will be critical for LA officials to leverage their existing facilities to curb costs. CEO of Los Angeles 2028, Gene Sykes, has expressed the organization’s commitment to utilizing Downtown’s many entertainment facilities, including the Staples Center, the Los Angeles Convention Center, the Microsoft Theatre, and the Coliseum. The University of California-Los Angeles (UCLA) will host the Olympic athlete village on its campus, taking advantage of the facilities left vacant by the University’s 44,000+ students over their summer vacation. Similarly, the campus of the University of Southern California (USC) will host media personnel throughout the Summer Games. In anticipation of the massive crowds drawn to the Summer Games, local legislators have recognized the need to upgrade infrastructure around the city. Toward this end, the Los Angeles City Council approved up to $4.9 billion for the construction of an automated light rail to alleviate congestion at Los Angeles International Airport. The contract to “design, build, operate, and maintain” the elevated train was awarded to the group known as LAX Integrated Express Solutions (LINX). LINX is comprised of seven ‘prime contractors.’ The thirty-year agreement is nontraditional in the sense that it includes funding for all aspects of the mega-project, rather than funding directed solely for construction purposes. While construction is expected to cost roughly $2 billion dollars, the contract’s full value of $4.9 billion is intended to cover all aspects of the project. Project officials anticipate the automated ‘people mover’ will be completed in 2023. In their 2011 article, authors Baloyi and Bekker indicate that hosting the FIFA World Cup, like the Olympic Games, is subject to major construction delays and budget overruns. To prepare for the 2010 World Cup in South Africa, ten stadium locations were selected for upgrades or construction—almost all projects were subject to cost overruns and time delays. Upon completion of the ten stadium venues, no official numbers or financials were released to the public, but the South African Minister of Finance was quoted saying that the World Cup project faced a budget deficit of $267 million. Baloyi and Bekker collected data on factors that caused cost overruns and time delays during the construction of the venues for the 2010 World Cup. Their findings are included below. Table 1: Factors causing cost overruns on the 2010 FIFA World Cup stadia. Table 2: Factors causing time delays on the 2010 FIFA World Cup stadia. Scandals, misappropriations, and deceit, have shrouded the preparations for the 2018 FIFA World Cup in Russia. Following a long deliberation process for the “highly-sought after hosting rights” to the second largest recurring sporting event, the World Cup was awarded to Russia in late 2010. 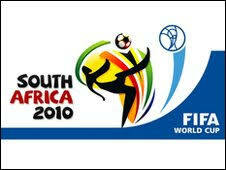 Only three years before the opening of the tournament, planning and preparations were in a nervous state of flux. In June of 2015, the Russian Government slashed the World Cup budget more than a half-billion in U.S. equivalent funds. Moreover, the Russian rights to host the cup were challenged by criminal investigations in the United States and Switzerland. The investigations cite allegations that bribes were pivotal in securing the success of FIFA’s secret vote. Construction cost overruns again reared their ugly head during the construction of Tottenham Hotspur’s new facility. During the construction of its new soccer stadium, Tottenham, a Club in the English Premier League, announced that the estimated £400 million cost of the project would be doubled to more than £800 million. 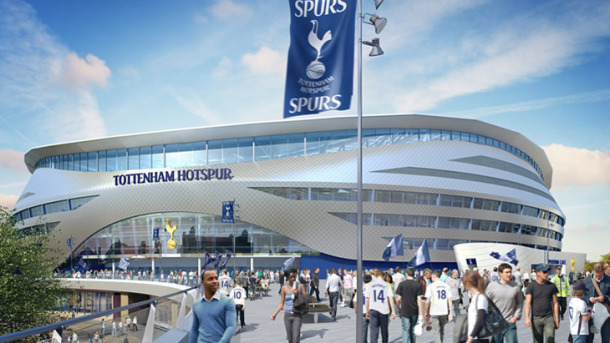 While the Club’s supporters cite the United Kingdom’s succession from the European Union as the reason for the massive price hike, Tottenham Club Director Donna Cullen hinted that “an alleged 20 percent increase on foreign construction goods prices result[ed] from Brexit’s impact on the exchange rate and labor costs.” Other critics argue that Club Chairman Daniel Levy’s failure to secure a £400 million naming-rights deal had an adverse effect on the overall stadium cost. The 61,000 seat stadium is set to debut for the opening of the 2018-19 English Premier League season, but there is no telling what the final cost of the project may eventually be. Multiplex originally bid cost of construction at £326.5 million, but costs had risen to £445 million by the time the agreement was officially signed. Sects of the British public believe that Multiplex was primarily responsible for the project failure, but the firm points the finger at Mott MacDonald, the British consulting powerhouse. Seeking £253 million in damages, Multiplex argued that stadium designs created by Mott McDonald were “not correct, constructible, coordinated and/or consistent,” and that steelworks plans were “not fit for purpose.” The parties settled the dispute out of court in 2010 after warnings from Technology and Construction Court Justice Coulson that the parties would face more that £74 million in penalties. Introducing a platform like ‘Pulse’ could be extremely beneficial to budget makers and project managers. It is important to note that these technologies are better suited for implementation on smaller-scaler projects in the short-term. The company suggests that “[m]egaprojects are often not the best candidates for big technology deployments; instead, starting small and developing capabilities with midsize projects” can better establish the value of the technology. In an article for Digitalist Magazine’s Internet of Things series, author and electrical engineer Michael Schomberg identifies several core innovations expected with adoption of digital tools. 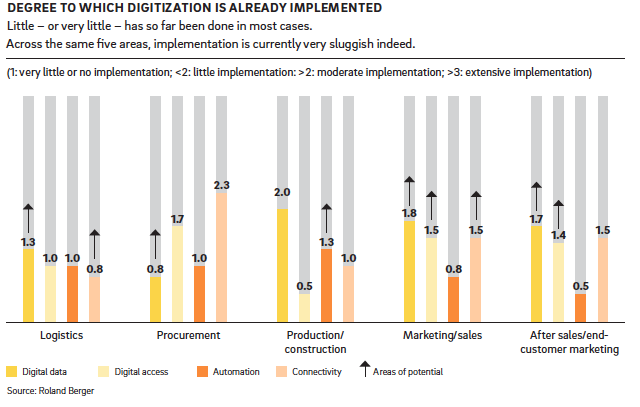 First, the transfer of knowledge and information must be exchanged digitally—paper plans and models are outdated. Second, construction sites can increase efficiencies using robotic assistance for installation, data collecting seniors, and 3D models to construct smaller components. Third, and maybe most importantly, labor unions will need to be modernized to increase labor efficiencies. 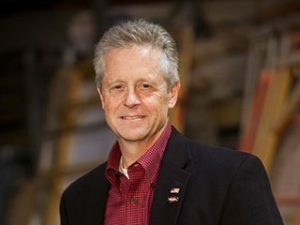 The author suggests that an “Angie’s List” style internet platform would provide for greater access to uniquely skilled craftsmen. While electronic technologies offer an avenue by which to increase efficiencies and ultimately prevent construction cost overruns, structured personnel and top-down management are also crucial to the success of the construction project. Sport$Biz had the opportunity to gain valuable insight from two immensely talented and passionate construction executives, Derek Cunz (“Cunz”) of M.A. Mortenson Company and Adam Jelen (“Jelen”) of Gilbane Building Company. M.A. Mortenson Company was founded in 1954 by M. A. Mortenson and is headquartered in Minneapolis, Minnesota. 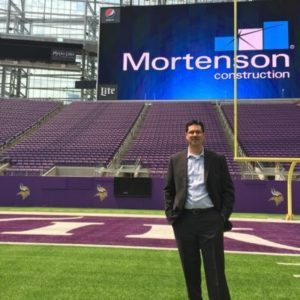 Mortenson’s projects have included US Bank Stadium and the Las Vegas Stadium for the NFL, Allianz Field for MLS, and the Wisconsin Entertainment and Sports Center for the NBA. Gilbane, Inc., founded in 1873, is “headquartered in Providence, Rhode Island, [and] is one of the largest privately held family-owned construction and real estate development firms in the industry.” Gilbane’s projects have included the New Jersey Devils’ Prudential Center, the Baltimore Ravens’ M&T Bank Stadium, and the Cleveland Indians’ Progressive Field. Cunz asserted that construction cost overruns and other project failures are often due to misalignment of the project’s key stakeholders. Parties that are ultimately responsible for delivering on the project are likely absent at a project’s inception. Because each stage of preparing the project is deeply connected to the preceding stage, a poor design will lead to inefficiencies in construction, which only gives rise to schedule delays, changes in scope, and budget overruns. An endeavor of stadium size will likely be influenced by many parties with a stake in the outcome. Owners with an interest in the project will pull the project in many different directions, and it is important to stay within the original scope of the project to avoid cost overrun. Therefore, contract drafters must be fully aware of the burden that they are allocating to each party to the agreement. Cost overruns can present a difficult situation when shared responsibility exists between parties, as each side will present a scenario in which they believe they are not responsible for paying the bill. To minimize cost overruns, controlling entities must be cognizant of the policies and procedures they employ during the construction process. Through the lens of Olympic facility construction, key stakeholders are often absent during the bidding process. The competitive nature of the Olympic bidding process has encouraged under-estimations of project costs and unrealistic expectations. This results in critical failures meeting client expectations for budget management and construction completion dates (here the “client” is the IOC). Mirroring the conclusions from the McKinsey & Company study above, Cunz confirmed that the construction industry struggles to leverage innovative technologies. However, Cunz suggested that those able to implement cutting-edge technologies are more capable of managing risk and adjusting to unforeseen circumstances. Though “the construction industry has historically lagged [behind] the other manufacturing industries in terms of industrialization and digitization,” Cunz credits a significant part of Mortenson’s success to their aggressive development and implementation of new technology in delivering complex construction projects. 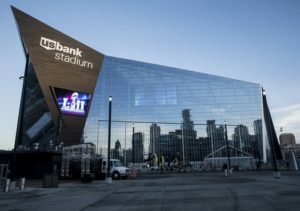 In recalling the construction of U.S. Bank Stadium in Minneapolis, Minnesota, Cunz explained that the positive results were highly correlated to their innovative construction design and delivery practices. “We were placing concrete on the exact same day we planned it, two years prior. That kind of precision is what digital industrialization tools allow you to do in construction.” Cunz credits the company’s pursuit of efficiency-maximizing technologies for Mortenson’s ability to deliver the U.S. Bank Stadium project in under thirty-two months. Cunz emphasized the importance of hiring contractors and construction techs with the necessary experience for the project. Modern stadium facilities feature amazing technologies, and construction companies are often providing services that they have never executed before the project start date. “The complexity of long-span roofs, floor to ceiling heights, radial bowl design, [and] mechanical-electrical systems that go into stadiums are very unique to the product-type technology. If you haven’t done it before, you don’t appreciate what it takes to get it done.” Further, an article from Project-Management.com asserts that vendor capabilities, scheduling, and the scope of the construction plan are large factors that influence cost overrun. Complex projects like a sports venue will require the use of many outside vendors and contractors, and it is vital to determine that the construction manager has the ability to complete the work within the proposed budget. During our conversation with Gilbane’s Adam Jelen, the construction executive stressed the importance of two formulas in the big picture for complex construction projects. First, cost = expectation = scope. The total project cost can only be accurate when cost, expectation, and scope are balanced. Parallel to the sentiments expressed by Mr. Cunz, cost, expectation, and scope are outlined at the project’s outset, and without an alignment of key stakeholders it is impossible to correctly determine the parameters of the project. Mr. Jelen asserts that when project planning becomes central to the project vision, parameters are set to account for unforeseen circumstances and contingencies. Processes may still go awry, but with the proper parameters, the team is ready to amend their course of action at a moment’s notice. Second, Total Project Cost = Hard Costs + Soft Costs. Jelen highlights this as a fundamental flaw of many bidding processes throughout the industry. Companies frequently design projects to only the hard costs of the project, neglecting soft costs incurred during and after the project’s construction. Both Cunz and Jelen agree that the success of major construction projects lies in the following: the leadership present; the degree to which the project’s key stakeholders are aligned in their vision for schedule, budget, scope, construction execution; and final delivery. You treat the design no different from a controls and discipline standpoint, and then the construction phase. It’s a ‘military’ alignment between team members, working integrated throughout the design process. The procurement process is done collectively as a team–it’s a very detailed fashion [with] robust documentation [. . .] you are closing out the job every month, meeting with principals [. . .] you are aligning these costs every month from a total project perspective so there are no surprises. In considering the application of digital technologies like “Pulse,” Jelen emphasized that the best technology in the world can be useless when implemented on a poorly designed and under-planned project. Jelen believes that technological advances can improve communication between project management and construction teams and reduce inefficiency in the industry, but he warns not to over-prioritize technologies. You could talk with all kinds of folks that could tell you why condition change management, and management, and I use this system, [that system] [. . .] that’s great, but if you don’t have the right team in the right business decisions upfront, with a robust process from day one, you are still going to get the same outcome. All you’re doing is counting widgets at that point. Pointing fingers. Anyone can take off drawings and come up with quantities, right? Most bad projects are born during the conceptual stage of the project. Vision, program, scope, budget, and schedule must all be synchronized early in the life of the project. Clear, honest and open communication and realistic expectations and objectives should be developed together, by all of the project stake holders, which should include: Knowledgeable construction experts, experienced in risk evaluation and risk management. Engage in activities that reduce the likelihood of litigation build a strong project team and assess the value of more formal collaboration, such as integrated design. As discussed in Part 1, Barry LePatner, Construction Attorney with LePatner & Associates, contends that there is no reason for stadium-sized projects “[n]ot to be built to the exact design specifications that were submitted, for a true complete price.” The aforementioned information gap combined with pressure from construction managers to meet deadlines has created a pattern of ‘fast tracking’ projects without completed designs. LePatner asserts that excessive change orders and additional design drawings are frequently associated with a ‘fast-tracked’ stadiums and will lead to 20-30% price increases. Today, construction loans are regularly secured with no less than 40-50% of the required equity, which has only tightened project margins. Moreover, these price increases are borne by the end consumer as owners are unable to secure last minute commitments from public entities or mezzanine lenders. Inflated prices have only led to owner attempts to recover massive budget gaps by selling seat licenses and increasing prices on food, drinks, apparel, and parking. Rule 4: Demand On Time and On Budget Project Completion. 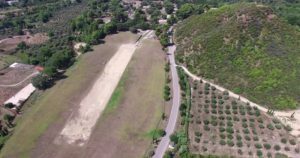 A project that has such deep impacts on a community and that is developed under a high level of public scrutiny is unlikely to avoid construction cost overrun. Moving forward, public entities that seek to construct a sports venue using public tax dollars should look to employ these tactics to minimize the financial risk to the taxpayers, while still allowing professional sports to thrive in their city. It is evident that construction companies can only hope to control their exposure to cost overruns by implementing extensive planning procedures at the outset of the project. The project’s key stakeholders must be aligned in their vision, scope, and budget for the project. 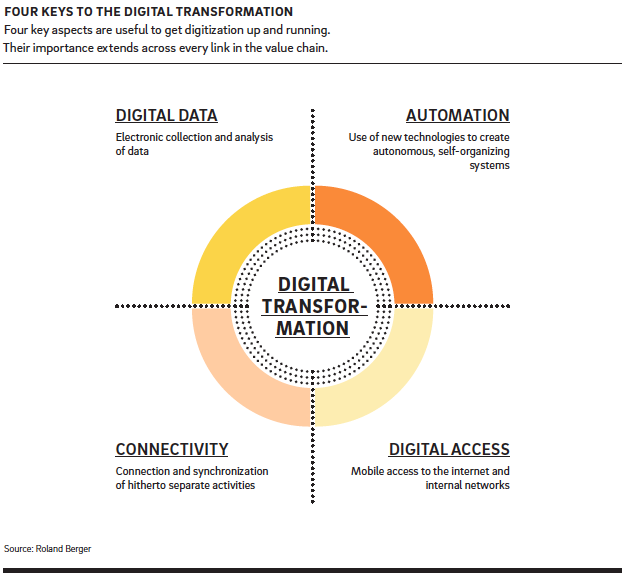 The future of digital technology offers opportunity for companies to increase efficiency and bring their business practices into the 21st century. Practicing diligence in planning is critical to a successful project. Though cost overruns have plagued the construction industry from time, strategies and best practices are available to those interested in perfecting their techniques and ultimately, minimizing risk to the client and the business itself. Daniel S. MacMillan is graduate of Marquette University Law School and recipient of the Certificate in Sports Law in addition to his Juris Doctor. MacMillan most recently worked as a Compliance Intern under Athletic Director Todd Garzarelli at University of Wisconsin-Whitewater. He also served as the Articles and Survey Editor for the Marquette Sports Law Review (Volume 28) and as the Justice for the LaFollette Chapter of Phi Alpha Delta. Prior to his time at Marquette, Daniel earned his Bachelor of Arts in Political Science from the University of Kansas, with minors in Public Policy and Economics. Martin Muller, The Mega-Event Syndrome: Why So Much Goes Wrong in Mega-Event Planning and What to Do About It, Journal of the American Planning Association, 81:1, 6-17, Winter 2015, https://doi.org/10.1080/01944363.2015.1038292. Staff Writer, The Olympic Games, History.com (2010), http://www.history.com/topics/olympic-games. 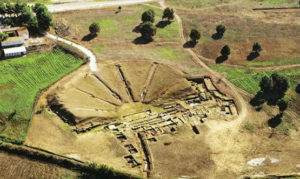 Olympic History – From the Home of Zeus in Olympia to the Modern Games, Olympic.org, https://www.olympic.org/ancient-olympic-games/history (last visited July 11, 2018). Staff Writer, supra note 4. 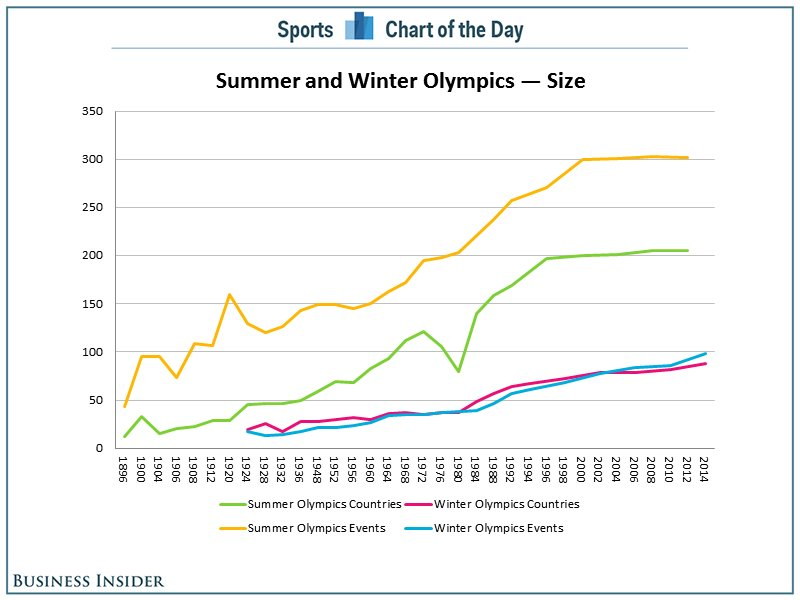 Cork Gaines, CHART: The Winter Olympics Is Narrowing the Gap with The Summer Olympics, Business Insider (Feb. 19, 2014), http://www.businessinsider.com/winter-olympics-comparison-summer-olympics-2014-2. James McBride, The Economics of Hosting the Olympic Games, Council on Foreign Relations, Jan. 19, 2018, https://www.cfr.org/backgrounder/economics-hosting-olympic-games. Bent Flyvbjerg, Allison Stewart, & Alexander Budzier, The Oxford Olympics Study 2016: Cost and Cost Overrun at the Games (July 2016), https://arxiv.org/pdf/1607.04484v1.pdf. Cathy Newman, Olympic Games: Legacy or Money Pit? Despite the Feel-Good Effect, the Games Are Always a Budget Buster, National Geographic (Feb. 22, 2014), http://news.nationalgeographic.com/news/2014/02/140221-olympics-sochi-rio-de-janeiro-london-boris-johnson-montreal-athens-world/. IMIA Working Group, Cost Overrun in Construction Projects, page 10 (49th Annual IMIA Conference – Qatar, Sept. 2016), https://www.imia.com/wp-content/uploads/2016/09/IMIA-WG96-cost-overrun-paper-final-version-b1.pdf. Christopher Koopman & Thomas Savidge, Rio’s Olympic Win is Rio’s Economic Loss, Inside Sources (Aug. 8, 2016), http://www.insidesources.com/rios-olympic-win-is-rios-economic-loss/. Editorial: The Olympics’ Bad Economics, Investor’s Business Daily (Aug. 19, 2016), http://www.investors.com/politics/editorials/the-olympics-bad-economics/. Binyamin Appelbaum, Does Hosting the Olympics Actually Pay Off?, N.Y. Times (Aug. 5, 2014), https://www.nytimes.com/2014/08/10/magazine/does-hosting-the-olympics-actually-pay-off.html. Clay Dillow, Hosting the Olympics is a Terrible Investment, Five Thirty Eight (Aug. 15, 2016), https://fivethirtyeight.com/features/hosting-the-olympics-is-a-terrible-investment/. 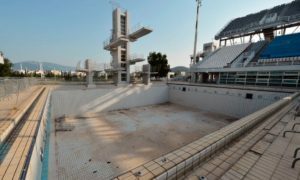 Judith Grant Long, Rethinking Olympic Infrastructure, LSE Cities, https://lsecities.net/media/objects/articles/rethinking-olympic-infrastructure/en-gb/ (last visited July 11, 2018). Id. ; Ryan Bradley, Why Hosting the Olympics is a Lousy Deal, Fortune (July 28, 2016), http://fortune.com/2016/07/28/olympics-host-city-downside/. Grant Long, supra note 24. Robert A. Baade & Victor A. Matheson, Going for the Gold: The Economics of the Olympics, 30 J. of Economic Perspectives 2, 201-218, https://pubs.aeaweb.org/doi/pdfplus/10.1257/jep.30.2.201. Bryce Covert, What Happens to Rio’s Economy Once the Olympics Leave?, Think Progress (Aug. 17, 2016), https://thinkprogress.org/rio-olympics-economics-711b539d2517/. Flyvbjerg, Stewart, & Budzier, supra note 13. 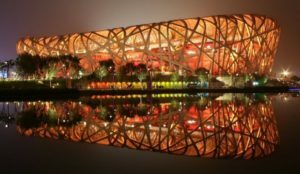 Jordan Weissman, Empty Nest: Beijing’s Olympic Stadium Is a Vacant ‘Museum Piece’, The Atlantic (July 31, 2012), https://www.theatlantic.com/business/archive/2012/07/empty-nest-beijings-olympic-stadium-is-a-vacant-museum-piece/260522/. 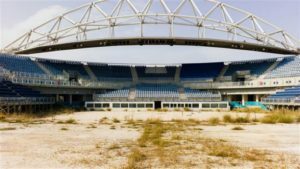 Steven Bloor, Abandoned Athens Olympic 2004 Venues, 10 Years On – in Pictures, The Guardian (Aug. 13, 2014), https://www.theguardian.com/sport/gallery/2014/aug/13/abandoned-athens-olympic-2004-venues-10-years-on-in-pictures. Andrew Zimbalist, 3 Reasons Why Hosting the Olympics Is a Loser’s Game, The Atlantic (July 23, 2012), https://www.theatlantic.com/business/archive/2012/07/3-reasons-why-hosting-the-olympics-is-a-losers-game/260111/. Craig Dale, Rio 2016: Economists Question Wisdom of Hosting Olympics, CNBC (Aug. 4, 2016), https://www.cnbc.com/2016/08/04/rio-olympics-2016-economists-question-wisdom-of-hosting-olympics.html. See Covert, supra note 30. Brent Swails & Marilia Brocchetto, Brazil’s Rio State Seeks Emergency Funding Ahead of Olympics, CNN (June 18, 2016), http://www.cnn.com/2016/06/18/americas/brazil-rio-state-emergency-funding-olympics/index.html. 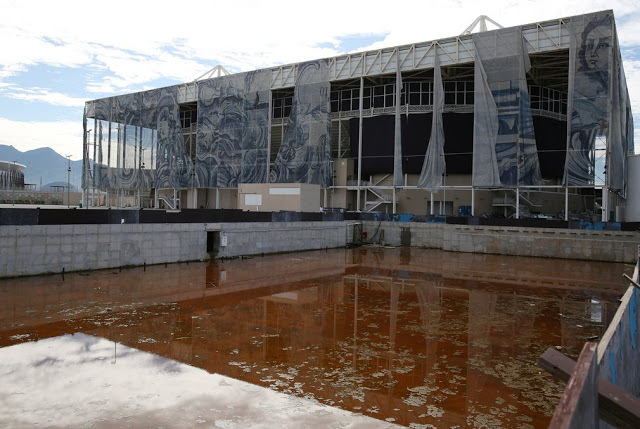 Emmett Knowlton, Here is What the Abandoned Venues of the Rio Olympics Look Like Just Six Months After the Games, Business Insider (Feb. 13, 2017), http://www.businessinsider.com/rio-olympic-venues-are-abandoned-just-6-months-after-games-2017-2/#the-olympic-village-too-is-a-ghost-town-2. 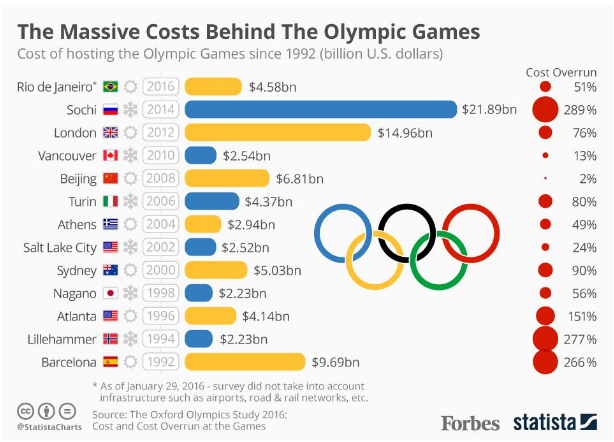 Niall McCarthy, The Massive Cost of Hosting the Olympic Games [Infographic], Forbes (Aug. 4, 2016), https://www.forbes.com/sites/niallmccarthy/2016/08/04/the-massive-cost-of-hosting-the-olympic-games-infographic/#2516d11d2e38. IMIA Working Group, supra note 16 at 7. Flyvbjerg, Stewart, & Budzier, supra note 13 at 18. Manuela Kasper-Claridge, 2020 Tokyo Olympics Face Vast Cost Overruns, DW Business (Oct. 21, 2016), http://www.dw.com/en/2020-tokyo-olympics-face-vast-cost-overruns/a-36114676. Associated Press, Tokyo 2020 Olympic Budget Still Flying High Despite Cost-Cutting Efforts, CBC Sports (Dec. 21, 2017), http://www.cbc.ca/sports/olympics/tokyo-2020-olympic-budget-1.4461801. Charles Riley, Budapest Drops 2024 Bid: Why Nobody Wants to Host the Olympic Games, CNN Money (Feb. 23, 2017), http://money.cnn.com/2017/02/23/news/olympic-games-cost-budapest-2024/index.html?iid=EL. Adam Nagourney and Jere Longman, Los Angeles Makes Deal to Host the 2028 Summer Olympics, N.Y. Times (July 31, 2017), https://www.nytimes.com/2017/07/31/sports/olympics/los-angeles-2028-summer-olympics.html. Zachary Zagger, LA 2028 Olympics Deal Reflects New Bidding Dynamic for IOC, Law 360 (Aug. 7, 2017), https://www.law360.com/sports/articles/951612/la-2028-olympics-deal-reflects-new-bidding-dynamic-for-ioc?nl_pk=66474645-2060-4d3a-b249-859d3fff536c&utm_source=newsletter&utm_medium=email&utm_campaign=sports. Scott Reid, Gov. Jerry Brown Signs Bill to Set Aside $250M for Potential LA 2024 Olympics Cost Overruns, Orange County Register, Sept. 29, 2016, https://www.dailynews.com/2016/09/29/gov-jerry-brown-signs-bill-to-set-aside-250m-for-potential-la-2024-olympics-cost-overruns/. David Owen, IOC Begins Los Angeles 2028 Instalment Payments, Inside The Games (Jan. 19, 2018), https://www.insidethegames.biz/articles/1060319/ioc-begins-los-angeles-2028-instalment-payments. 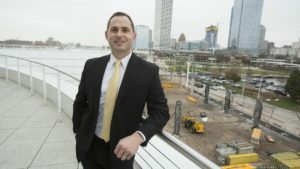 Nicholas Slayton, Downtown Will Have a Huge Role in the 2028 Olympics, LA Downtown News (Aug. 30, 2017), http://www.ladowntownnews.com/news/downtown-will-have-a-huge-role-in-the-olympics/article_52f420cc-8c15-11e7-8775-7b17231ac254.html. Braden Keith, LA2028 Video Tour of Olympic Village at UCLA, Swim Swam (Oct. 10, 2018), https://swimswam.com/la2028-video-tour-of-olympic-village-at-ucla/. Laura J. Nelson, City Council Approves Long-Awaited People Mover to LAX, LA Times (Apr. 11, 2018), http://www.latimes.com/local/lanow/la-me-ln-lax-people-mover-20180411-story.html. Alison Statesman, LA City Council Approves $4.9B Contract for Automated People Mover at LAX, Commercial Observer (Apr. 16, 2018), https://commercialobserver.com/2018/04/la-city-council-approves-4-9b-contract-for-automated-people-mover-at-lax/. Fluor Corp. (Irving, Texas); Balfour Beatty (London); ACS Infrastructure Development (Coral Gables, Fla.); Dragados USA (New York); Hochtief PPP Solutions (Essen, Germany); Flatiron Construction (Broomfield, Colo.); and Bombardier Transportation (Montreal). See Howard Fine, LAX Board Approves $4.9B People Mover Contract, LA Business Journal (Apr. 5, 2018), http://labusinessjournal.com/news/2018/apr/05/lax-board-approves-49b-people-mover-contract/. Lucius Baloyi & Michiel Bekker, Causes of Construction Cost and Time Overruns: The 2010 FIFA World Cup Stadia in South Africa, Acta Structilia 2011: 18(1), https://www.researchgate.net/publication/265147259_Causes_of_construction_cost_and_time_overruns_The_2010_FIFA_World_Cup_stadia_in_South_Africa. Id. at 60-61; See South Africa 2010 Stadiums, SA Venues, https://www.sa-venues.com/2010/2010-stadium.htm (last visited July 11, 2018). Baloyi & Bekker, supra note 81 at 53. Russia and Qatar Awarded 2018 and 2022 FIFA World Cups, FIFA (Dec. 2, 2010), http://www.fifa.com/worldcup/news/y=2010/m=12/news=russia-and-qatar-awarded-2018-and-2022-fifa-world-cups-1344698.html (last visited July 11, 2018); 2018 FIFA World Cup Russia, FIFA, http://www.fifa.com/worldcup/index.html (last visited July 11, 2018); Matt Slater, Olympics and World Cup are the Biggest, but What Comes Next?, BBC Sport (Dec. 4, 2014), http://www.bbc.com/sport/30326825. Geoffrey Smith, Russia’s 2018 World Cup Preparations Are a Mess, On and Off the Field, Fortune (June 23, 2015), http://fortune.com/2015/06/23/russias-2018-world-cup-preparations-are-a-mess-on-and-off-the-field-2/. The Cost Overruns on Russia’s World Cup Stadiums Are Staggering, The Economist (July 20, 2017), https://www.economist.com/news/europe/21725330-they-have-become-symbol-corruption-under-putins-rule-cost-overruns-russias-world-cup. 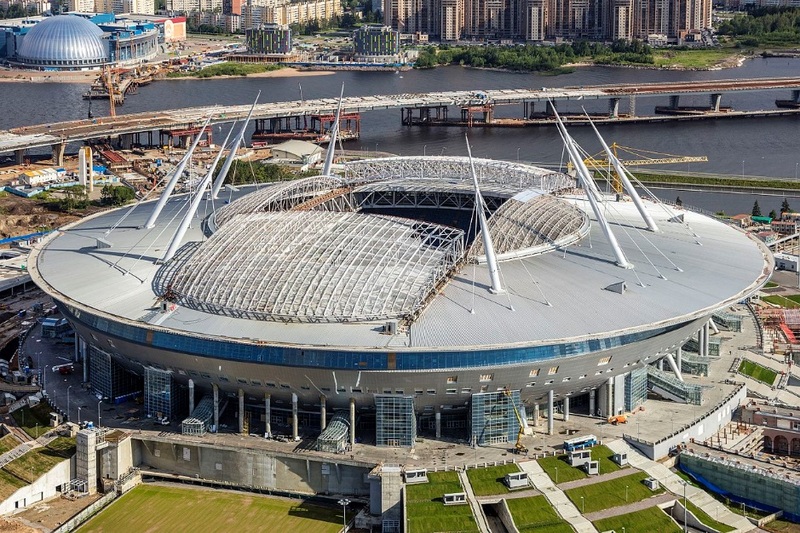 Saint Petersburg Stadium, FIFA, http://www.fifa.com/worldcup/destination/stadiums/stadium=5031303/index.html (last visited July 11, 2018). Andrew Vladimirov, The Story Behind FC Zenit’s Twelve-Year Construction Saga of Krestovsky Stadium in St. Petersburg, The Duran (Oct. 9, 2017), http://theduran.com/the-story-behind-fc-zenits-twelve-year-construction-saga-of-krestovsky-stadium-in-st-petersburg/. 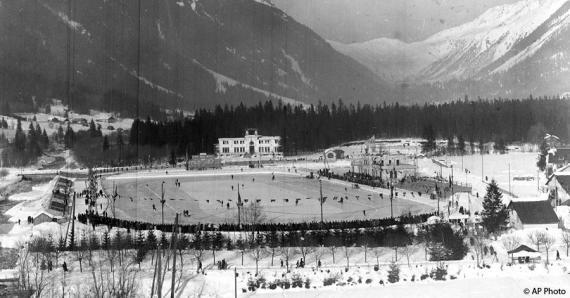 Fred Weir, Sochi Redux? St. Petersburg Stadium Echoes Battle Between Investment, Corruption, Christian Science Monitor (Mar. 16, 2017), https://www.csmonitor.com/World/Europe/2017/0316/Sochi-redux-St.-Petersburg-stadium-echoes-battle-between-investment-corruption. Tariq Panja & Andrew Das, World Cup 2026: United States, Canada and Mexico Win Bid to Be Host, N.Y. Times (June 13, 2018), https://www.nytimes.com/2018/06/13/sports/world-cup/fifa-2026-vote-north-america-morocco.html. Alasdair Gold, Tottenham Reveal Why Their New Stadium Costs Have Doubled to £800m, The Mirror (Mar. 7, 2017), http://www.mirror.co.uk/sport/football/news/tottenham-reveal-new-stadium-costs-9983339; Toby Gannon, Tottenham New Stadium: When Will Spurs Move In? Capacity, Cost and Name, The Sun (Aug. 20, 2017), https://www.thesun.co.uk/sport/football/2533595/tottenham-new-stadium-pictures-video-capacity-cost/. Matt Scott, Wembley Costs Soar Towards £1Bn, The Guardian (Feb. 23, 2006), https://www.theguardian.com/football/2006/feb/24/newsstory.sport2. Ben Quinn, £253m Legal Battle Over Wembley Delays, The Guardian (Mar. 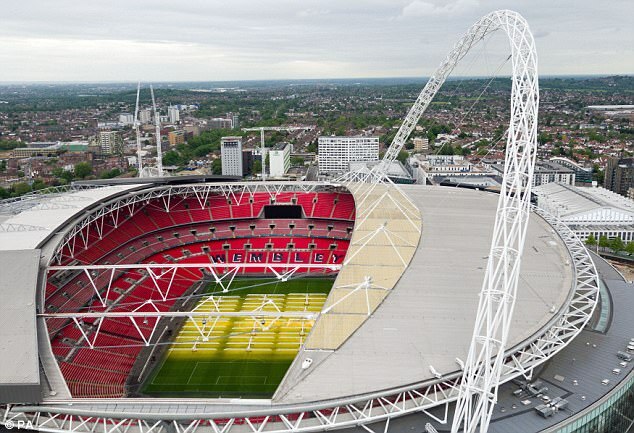 15, 2008), https://www.theguardian.com/business/2008/mar/16/construction.wembleystadium. Tom McGowan, Wembley: NFL Owner Shahid Khan Makes Bid for Iconic Stadium, CNN (Apr. 26, 2018), https://www.cnn.com/2018/04/26/football/wembley-nfl-shahid-kahn-jacksonville-jaguars-intl-spt/index.html. 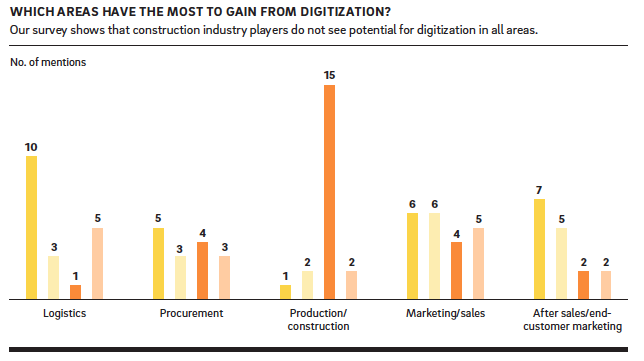 Rajat Agarwal, Shankar Chandrasekaran, & Mukund Sridhar, Imagining Construction’s Digital Future, McKinsey & Company (June 2016), https://www.mckinsey.com/industries/capital-projects-and-infrastructure/our-insights/imagining-constructions-digital-future. John Caulfield, A New Platform Offers a Solution to Construction Cost Overruns, Building Design + Construction (Sept. 13, 2017), https://www.bdcnetwork.com/PulsePM. Michael Shomberg, How Digitization Is Disrupting Construction: Strategies Forward, Digitalist: Internet of Things (Aug. 25, 2016), http://www.digitalistmag.com/iot/2016/08/25/digitization-disrupting-construction-strategies-forward-04417204. 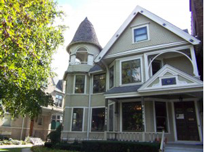 Angie’s List is a website that provides reviews of contractors, mainly servicing residential property owners. See https://www.angieslist.com (last visited July 11, 2018); Id. Derek Cunz is the Senior Vice President and General Manager for M.A. Mortensen Company’s Sports and Entertainment Group. See Derek Cunz, M.A. Mortenson Co., http://www.mortenson.com/sports/people/derek-cunz (last visited July 11, 2018). Adam Jelen is the Sr. Vice President for the Central/Midwest Division of Gilbane Building Company. See Top Building Contractor in Milwaukee, Gilbane Building Co., https://www.gilbaneco.com/locations/milwaukee-wisconsin/ (last visited Apr. 17, 2018). Company History, M.A. Mortenson Co., http://www.mortenson.com/company/history (last visited July 11, 2018). Projects, M.A. Mortenson Co., http://www.mortenson.com/sports/projects# (last visited July 11, 2018). Gilbane, Inc., Gilbane Building Co., https://www.gilbaneco.com/inc/ (last visited July 11, 2018). Sports & Entertainment: Building the Next Generation of Sports and Entertainment Facilities, Gilbane Building Co., https://www.gilbaneco.com/assets/SportsEntertainment_4PageBrochure_Web.pdf (last visited July 11, 2018). Phone Interview with Derek Cunz (Feb. 9, 2018). Balaji Viswanathan, 6 Ways to Prevent Cost Overruns, Project-Management (June 6, 2012), Project-management.com/6-ways-to-prevent-cost-overruns/. See Walt Disney Concert Hall, M.A. Mortenson Co., https://www.mortenson.com/cultural-performing-arts/projects/walt-disney-concert-hall (last visited July 11, 2018); see also AD Classics: Walt Disney Concert Hall / Frank Gehry, Arch Daily (Oct. 23, 2013), https://www.archdaily.com/441358/ad-classics-walt-disney-concert-hall-frank-gehry. Id; U.S. Bank Stadium hosted the most recent NFL Super Bowl between the Philadelphia Eagles and the New England Patriots. See U.S. Bank Stadium, M.A. Mortenson Co., http://www.mortenson.com/sports/projects/us-bank-stadium (last visited July 11, 2018); see also Tim Rohan, Glass, Angles and a Gjallarhorn: U.S. Bank Stadium Ushering in a New Wave of Stadium Design, Sports Illustrated (Jan. 29, 2018), https://www.si.com/nfl/2018/01/29/super-bowl-2018-us-bank-stadium-minnesota. Phone Interview with Adam Jelen (Mar. 1, 2018). 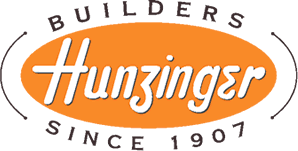 Who We Are, Hunzinger Construction, https://www.hunzinger.com/who-we-are/ (last visited July 11, 2018). Sports & Entertainment, Hunzinger Construction, https://www.hunzinger.com/sports-entertainment/ (last visited July 11, 2018). Comments of John C. Hunzinger on file with the author. Mitigating Construction Cost Overruns, CM&D Field Notes (3rd Quarter, 2015). Mitigation of Risk in Construction, McGraw Hill Construction (2011). Note: Italicized language was originally published in: Martin J. Greenberg and Daniel S. MacMillan, Cost Overruns and Sports Venue Construction, Sport$Biz (Jan. 3, 2017), https://www.greenberglawoffice.com/sports-venue-construction/; see Barry LePatner, Stadium Cost Overruns, Commercial Property Executive (Aug. 17, 2010), https://www.cpexecutive.com/post/qa-stadium-cost-overruns/. The Ross Group, 5 Tips to Avoid Construction Cost Overruns, From a Commercial Builder, Commercial & Industrial Construction Blog (Sept. 23, 2013), http://www.therossgrp.com/blog/bid/336695/5-Tips-to-Avoid-Construction-Cost-Overruns-From-a-Commercial-Builder (last visited July 11, 2018). Claire Bordat, Bob G. McCullouch, Samuel Labi, & Kumares C. Sinha, An Analysis of Cost Overruns and Time Delays of INDOT Projects 5, (INDOT Research, Final Report, Dec. 2004), http://docs.lib.purdue.edu/cgi/viewcontent.cgi?article=1482&context=jtrp. The Ross Group, supra note 184. Barry LePatner, Four Golden Rules to Eliminate Cost Overruns, 31 LePatner Report 1: Construction Cost Certainty, (Spring 2011).